The Gel Nano Flavor Fusion Mouthguard offers comfort, high impact shock absorption, and FLAVOR! The gel liner has been designed to take a self-fit custom impression of your teeth for a secure and comfortable fit throughout the season. With your teeth nestled in the vertical wall frame, the jaw line is secured limiting injury from side impact. Take the personalization of your Shock Doctor product even further by choosing from an array of offered colors. 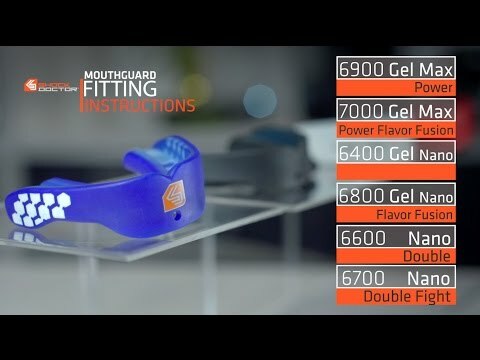 Gel Nano Flavor Fusion Mouthguard is rated 5.0 out of 5 by 11. Rated 5 out of 5 by Jaime N. from Excellent service and great product Communication was great and the products shipped quickly. The finish of the mouthguard is very good and the ease of use to get it molded to my mouth was great. Haven't had the opportunity to test its abilities to absorb a crushing blow yet, but from the quality of the finish, I'm sure it will perform admirably. Rated 5 out of 5 by Anonymous from Gel Nano Flavor Fusion The gel nano mouth guards always work great. My boys love the flavor fusion ones, but I'm not a fan of the strong smell. Eventually the flavor does wear off...but that smell stays forever! Rated 5 out of 5 by Anonymous from MMA review Awesome product!!! I was was saddened to hear this product was being discontinued. Hope not. My kids use this protection gear when they spar, As they grow I will be needing a bigger size. Rated 5 out of 5 by Christian S. from mouth pieces Both of my sons use these mouth pieces for football. It is all we use. Rated 5 out of 5 by Anonymous from Easy to fit and comfortable Easy to fit and comfortable to wear. My son loves the flavor, too.